• See versionhistory.txt for the full list! mIRCStats is a highly configurable yet easy-to-use log analyzer for virtually any kind of logfiles. It was originally developed for analyzing IRC channel log files created with mIRC and later with any IRC client. The current version adds support for RSSLogger logfiles so you can easily create stats for any RSS or Atom feeds that can nowadays be found on most websites. 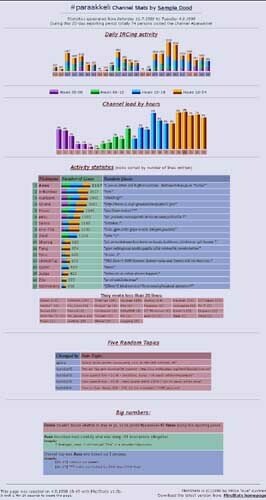 mIRCStats creates graphical HTML pages consisting of daily activity stats, user reports, detailed personal stats, user relation map, tables about chat topics, most used words, URLs and all kinds of miscellaneous information extracted from log files. It can also upload the pages to your WWW server to be viewed by your friends and web site visitors. [19:23] <number6> omega race... yepp, I remember. [22:41] <UnMoRTaL> i found the cheapest way! [7:48] <SSWsentry> [eXe-File] Puberty and Nuchos for all! [17:19] <number6> i think its on tv4? Stats updates can be easily automated. See the help file for more info. mIRCStats is a shareware software which means that you can try it for free and if you like it, you can activate a lot of new features by getting the full version! (Includes only changed files, unzip into your mIRCStats directory. Surprise your friends with the completely new set of stats! Get the full version! You'll receive your personal registration code file by email that opens all mIRCStats features! It's also a lifetime license that works in all upcoming mIRCStats versions too! mIRCStats uses bundle licensing with RSSLogger, meaning that the license file that you'll receive opens all features in both applications! The registration process is fast, simple and secure. Usually you'll get your registration code in your mailbox on the same day, sometimes even faster - within minutes from filling the registration form! Get the full version of mIRCStats here!